I love this flower, in Argentina, we call it "Hortensia". Funny, we call it 'Hortensia' in Poland as well. Clever you putting this into black and white. It so works that way. 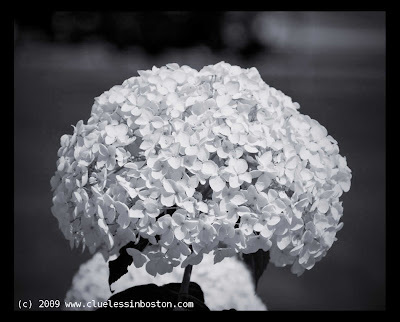 Makes me think of bridal bouquet or a wondrous hat - perhaps there is a face under it? yowza! what a GREAT picture! and i agree with jilly - here comes the bride! So simple. So elegant. Such a good post. Love it in black and white! Look at all those little flowers making that one giant head! Great shot.